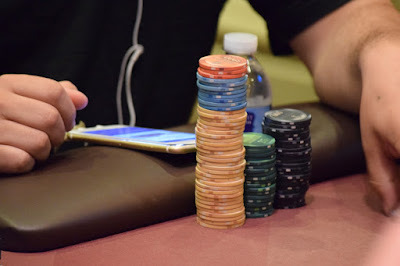 Today's $100 with a $5,000 Guarantee is an unlimited re-entry event, as is tonight's $100 PLO, tomorrow morning's Changeup and Thursday morning's $100 with $25 Bounties. The remaining Series events - Wednesday night's $100 HORSE, Thursday night's $100 Omaha8 and Saturday's OneDay$100,000 Guaranteed are 1+1 events - one entry and one re-entry per player. There's something for everyone this week at TVPokerRoom. Back to today's $5k Guarantee as Level 4 kicks in, with Rudy Robledo and Tracy Oto joining the field as Late Arrivals.